While the terror group imposed strict rules on all of recently liberated Mosul, women were especially oppressed. When ISIS is expelled from a city, women there are finally able to regain freedom. That's what's happening in Mosul, Iraq. Under ISIS' discriminatory laws, women and girls were often forced to stay at home. They also couldn't dress colorfully or pursue education. 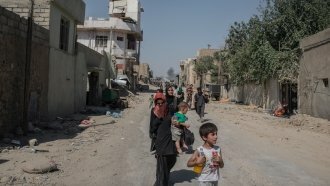 "Under Daesh, the situation was very tragic, especially because education under Daesh was nonexistent," Mosul resident Iman Khader said. "We had no right to attend classes, and there were many challenges and limitations placed on us, especially as women; we had to wear a face veil and a full covering and many other things." If they disobeyed, morality police would come after them. Women or their husbands could be whipped or fined. But in another areas of Iraq where ISIS is still in control, women continue to face these issues, along with difficulties accessing health care and other necessities. That's why a city's liberation from ISIS can be so empowering for women. So as Mosul begins a slow rebuilding process, shops are being refilled with colorful clothes. And women are returning with hope.